I’ve been feeling a bit nostalgic lately. My Timehop keeps reminding me of all of the fun I was having exploring Japan last summer and I miss it. Japan is a fascinating and colorful country with a unique and multifaceted culture. 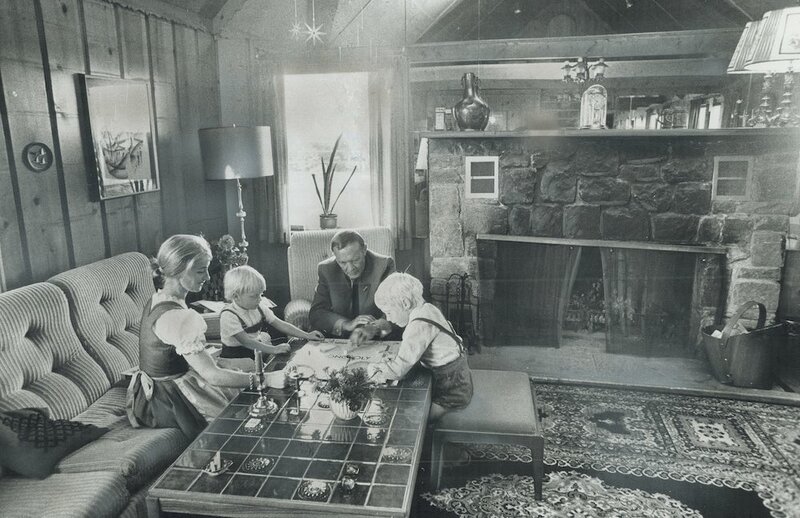 It is a place where the traditions started thousands of years ago meet and intertwine with modern-day innovation. I thoroughly enjoyed my time in Japan and long to return someday. Instead, I will revisit Japan through board games. With so much to draw inspiration from in this beautiful country, it’s no surprise that there are so many games that either take place in Japan or have a Japan-inspired theme. The first game I want to talk about, Tokaido, takes a look at Japan from the same perspective that I saw Japan: as a tourist. 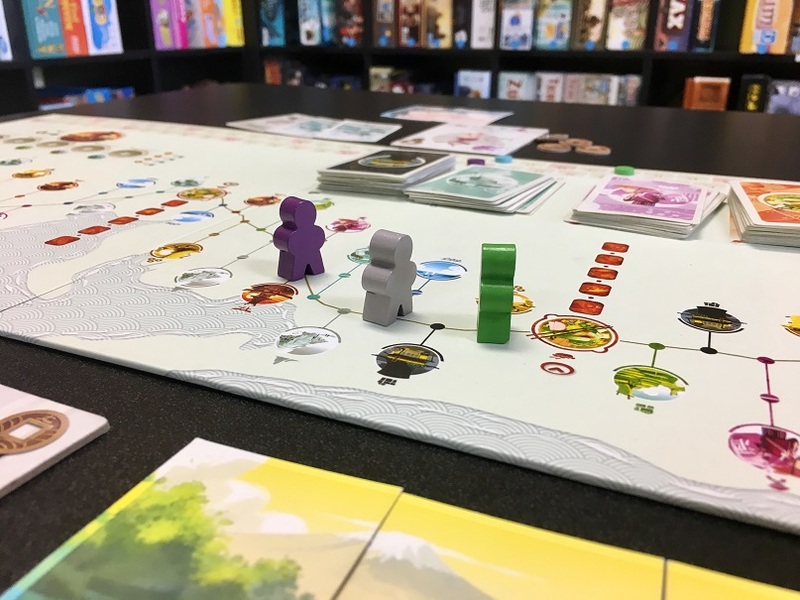 In Tokaido, players take on the role of travelers in the days of old trying to make the most of their journey along the real-life “East Sea Road.” Known as Tokaido, this road was one of the most important as it connected two of Japan’s largest cities, Kyoto and Edo (a city you probably know as Tokyo). The goal of the game is simply to be the “best” traveler, which means that you need to see the sites, eat good food, and collect souvenirs. If you’re in Japan and you travel between Tokyo and Kyoto (something I did twice), you’re probably traveling across the East Sea Road. My experience of modern-day Tokaido was probably quite different from that of the fictional travelers of the game as they’re traveling by foot over the course of several days and I traveled using the incredibly efficient train system that took less than four hours. However, the tradeoff is that they may be better tourists in this area than I was because, though you sometimes get some great views out of your window, it’s hard to fully experience the area from your train seat. The next game centers on a staple of Japanese cuisine, sushi! 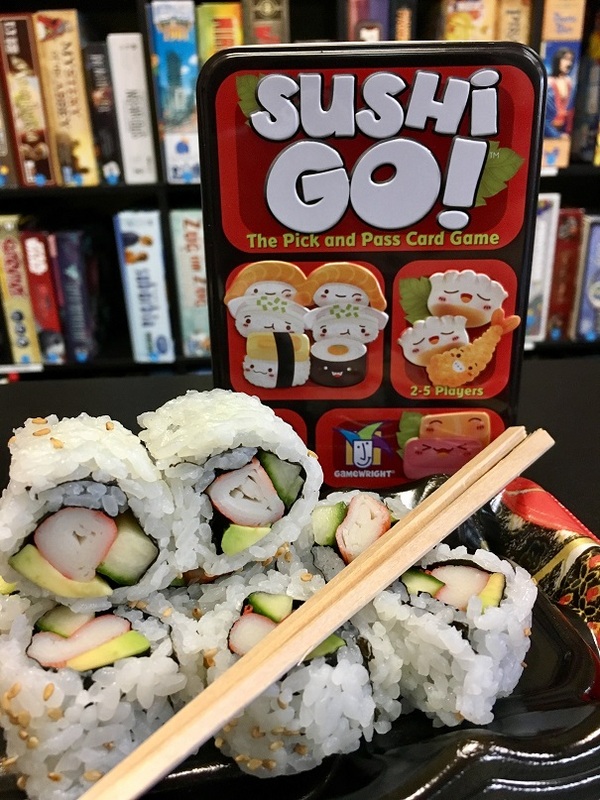 Sushi Go is a game in our “breadstick” section, meaning that it is an easy game to learn and quick to play. The idea of the game is to continuously pass your hand of sushi cards around the table and collect the best combinations to gain the most points. The game is reminiscent of the infamous sushi conveyor belts where you pick up sushi as it passes by. I must admit that I did not make it into one of these restaurants as neither I nor my traveling companion are big into seafood, but it’s certainly something high on a lot of tourists’ lists of things to do. Disclaimer: We do not serve sushi! Japan is famous for their many festivals. I mean, if you’ve ever watched any sort of “slice of life” anime, there is always an episode where the main characters go to a festival. Ergo, checking out one of the many festivals should definitely be high on the priority list when visiting Japan. We were in Tokyo during the Adachi Fireworks festival, an hour-long display of over 12,000 fireworks. Thousands of people gathered along the banks of the Arakawa River, dressed in traditional yukata (a casual summer kimono), and lounging on picnic blankets. As far as I could see down the river, it was packed with people and food stands were set up throughout the area. My friend and I ended up pretty far away from where the action was taking place, but the fireworks were so big and magnificent that we could still see everything perfectly. We watched as thousands of fireworks lit up the night sky, listening to the sounds of hundreds of people around us “oohing” and “aahing” in unison. The commute back to our Airbnb was one of the most crowded subways I’ve been on (and I lived in NYC for four years), but it was well worth it. 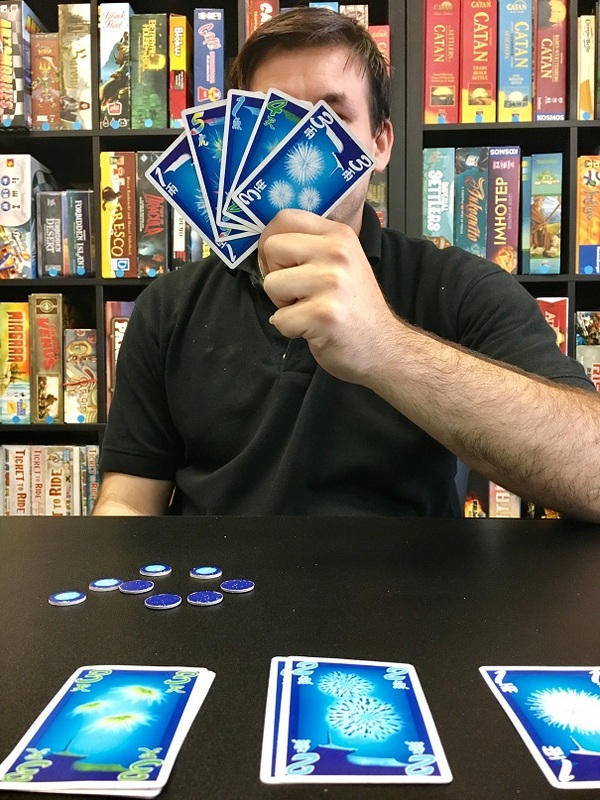 Hanabi, the Japanese word for “fireworks,” is a game where players become firework manufacturers rushing at the last minute to make sure all of the fireworks are ready for an upcoming festival. Players work together to assemble fireworks in piles by color from number one to five. Each player has a hand of cards (each with a color and number) that you hold up with the back facing you, meaning that you don’t know what is in your hand, but other players do. You give each other clues to make sure that your teammates play the right card at the right time. If you make a mistake, the fireworks might explode on you! I’m realizing now as I write this that we never saw any pandas in Japan. We saw monkeys and deer, but never made it to the Ueno Zoo to see a panda. Pandas are native to China, but China has been known to give pandas to other nations as diplomatic gifts. This practice is known as “Panda Diplomacy” and is a practice going back more than a thousand years. There are records from the Tang Dynasty that Empress Wu Zetian sent a pair of pandas to the Japanese emperor. 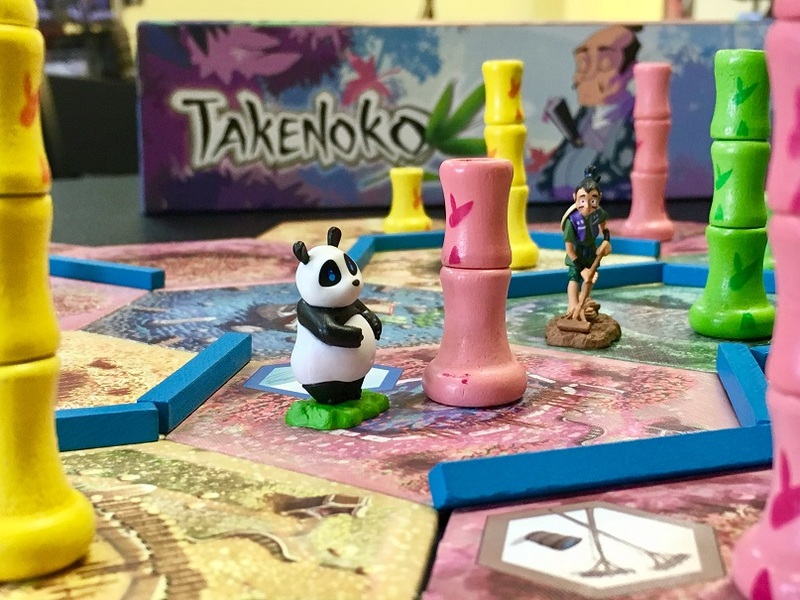 In Takenoko, the Chinese emperor has gifted the Japanese emperor with a panda as a symbol of peace and the players are now in charge of taking care of it by tending to the bamboo garden. With the help of the imperial gardener, players must plot the land, irrigate the soil, grow bamboo, and use it to feed the panda. You get points based on how well you do all of those things and the player who manages the garden the best is the winner. Of course we can’t talk about Japan without talking about the bright lights of the big bustling cities like Tokyo and Osaka. Cities in Japan are unlike any cities I’ve visited before. They’re so fantastical and surreal. I remember being in Osaka and thinking that it seemed more like an amusement park than a city. Walking under the towering skyscrapers in Tokyo with their giant, brightly-lit signs and billboards surrounded by so many different people was reminiscent of Times Square, but instead of being just a few blocks in the most touristy part of the city, it was the whole city. 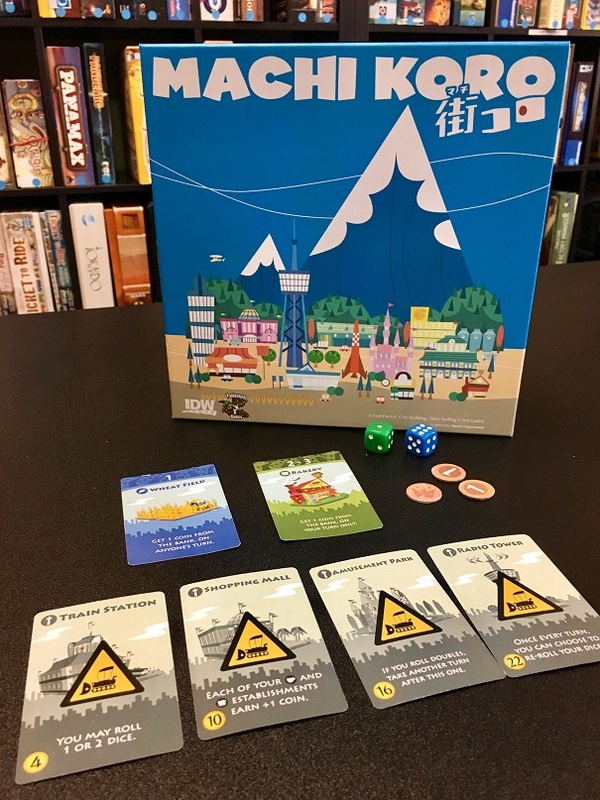 One game that captures that big city feel is Machi Koro, a city-building game based in the fictional city of “Dice Town.” Players become mayors of this up-and-coming city, tasked with the job of growing their cities as fast as they can to meet the demands of its citizens. There are six main landmarks that you must build in order to win, but throughout the game you will build a number of other establishments in order to generate income based on your dice rolls, so you can finish construction on your landmarks. The fast-paced growth of your city and the randomness of your rolls emulate the chaos of a real city. And you may wind up spending a lot of money eating out just like if you were living in a real city. One of the most notable monsters in fictional history is Godzilla, a giant dinosaur-like creature that originated in Japan. Another monster, King Kong, has famously climbed the Tokyo Tower. Robots and robot suits are common themes in Japanese anime and manga. It only makes sense that Tokyo would be the perfect place for monsters to converge and battle it out to be the best of the best. The last game I want to talk about is King of Tokyo, a game where just that happens. 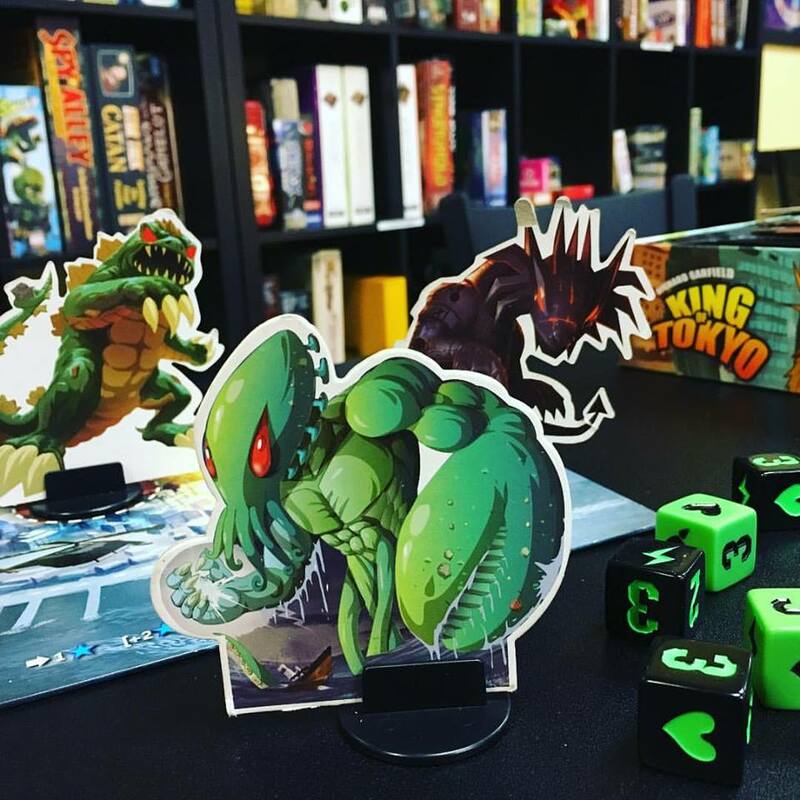 In King of Tokyo, players control a different monster trying to take over the city of Tokyo. Control of Tokyo will change throughout the game, as players fight each other, take damage, and gain victory points. Different things can happen to your monster to make you stronger and help you defeat your enemies and you may be able to heal your monster. Ultimately, you want to gather victory points as the first person to get to 20 victory points (or the last monster standing) is the one who destroys Tokyo and wins the game, becoming the King of Tokyo. These and a few other Japan-inspired games can be found in our library. If you want a small taste of this incredible country come in and check one of them out!